Losing means... well, it probably means that you were too drunk and fell off your giant chicken during the jousting competition. A simple mission to recover a stolen device turns into something more as the Fated get pulled into a competition between rival Gremlin families in a sprawling Bayou Bash. So load your shotgun, grab your best pig, and try to avoid catching fire as you compete in the most gruelling contests seen in the Bayou since the last time this sort of thing happened! 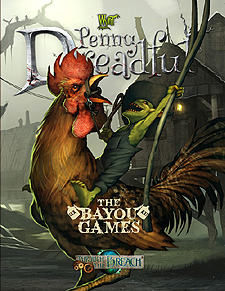 The Bayou Game is a fun four session Gremlin-focused adventure for the Through the Breach roleplaying game. It requires the Fated Almanac to play and is a good companion adventure for the Into the Bayou expansion.